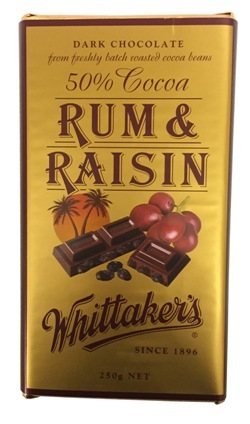 Made up of 50% dark cocoa, soft Californian raisins, and an infusion of rum. Dark Chocolate (Cocoa Solids 50% (Cocoa Mass, Cocoa Butter), Sugar, Emulsifier (Soy Lecithin), Rum Flavour, Vanilla Flavour), Raisins (28%). Dark Chocolate contains Cocoa Solids 50%.